Tin and Slate Roofing. 43j E, Houston St., N. "i. Bet. C2d and G3d Sts. Depot, 326 West 40th St. Send for Circulars and Prices. Factory, 481 Driggs Ave,, cor. N. 10th St.
Buildings, etc. Send for Cii cular. FIRE   PROOF   DOORS,   SHUTTERS   AND   PARTITIONS. Offlce." 264'Ave, A, bot. IGth and 17th Sts.. N. Y.
Tin, Tile and Slato Eooflng. 606   West   29th   Street,      New   York. Ia Brass, Bronze and Iron. Ross Building, cor. Bank St.
Jobber in all kinds of 'Window Glass. 220 WEST 14th ST., N. Y.
Sketches  Made  and   Estimates   Given. Fifth  Avenue and SOth Street. *                   SeventU Avenue and 29lti Street. Office, Hotel St. George, Brooklyn Heights,N.V. Prencb end American Plate Glass and Mirrors. US EIGHTH AVE.. Bet 17th and 18th Sts., N. T.
and put up at reasonable rates. Tin, Tile and Slale Roofing,            3011 East ;«lth St. Heating and VeutilatingWork. Tel.,G'J13a 3Sth. 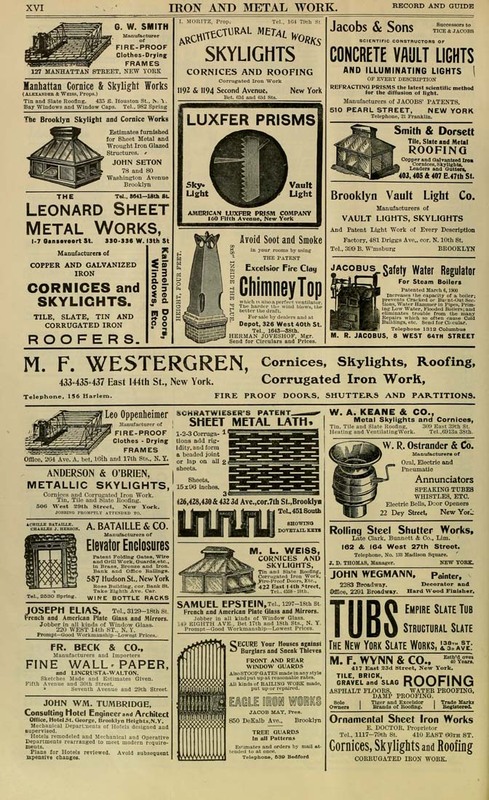 W. R. Ostrander & Co.
Late Clark, Bunnett & Co.. Lim. 102 &  164 West   27th   Street. Telephone, No. 133 Madison Square. J. D. THOSIAS, Manager. NEW TOBZ. Office. 2201 BrOftdwir. Hard Wood FiBlihar. M. P. WYNN & CO.,    '''TyZV. 417 East SSd Street, New Tork. Tol.. 1117-79th St.         410 EAST 6Gth ST.